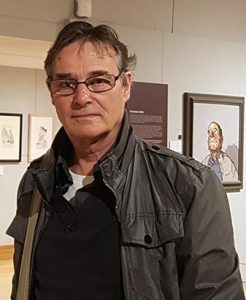 Artist Roy Munday, runs the art classes on Merseyside. Roy is also a practicing artist. We are very much a community based art group. We have several art exhibitions each year. Also, we use empty shops for several weeks. 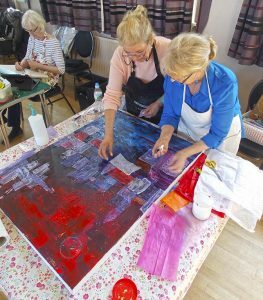 Two of our members working together on one painting. As well as a practicing artists, with most of my paintings in private collection, though one painting, 'The View from The Roof' and commissioned by John Moores university is part of the national art collect. Like many artists, I enjoyed art at school, but once I left, then life took over until I was able to devote more time to learning the skills. Like most people new to art, I started attending evening classes. Once I'd exhausted these, I started a foundation art course which eventually led to a fine art degree course at John Moores university, where I graduated in 2004. After graduating from John Moores univserity with a degree in fine art, I spent the first two years in a studio in Liverpool and where I started to get my first successes. Firstly with an important commission for John Moores university. Also in 2008 when I was one of the artists whose painting appeared on a calendar to commemorate Liverpool's granting of its Royal Charter. I continued to produced commissioned paintings, mostly of Liverpool's waterfront. In recent years, the art classes have taken over and our art group, the Sefton Art Group, is one of the biggest weekly class groups in the north west. Our members come from throughout the Sefton region, also from Lancashire and Liverpool. The majority enjoyed art at school, then, like myself, life took over and art was put to one side. Most of the memberes are a mixture of retirerd people, but also those who are still working. 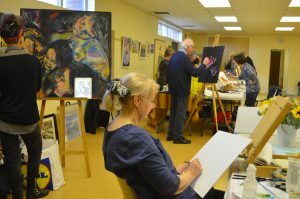 Also, a sprinkling of school age members who are either doing A level art, or are gaining instruction prior to taking on either a Foundation art course or a Fine art degree. or have been to previous art classes that offer no or little tuition, they start with the very basics, 'how to draw accurately'. This isn't as daunting as it sounds and you can learn the technique of measuring in a few hours, then with practice you will be able to draw up any subject. Members are encouraged to exhibit. We have at least two exhibitions a year, at Lydiate parish hall. 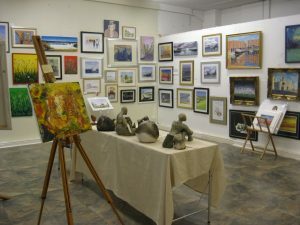 This allows members to begin exhibiting and to hopefully make a start at selling their work. The majority of members have sold. Those who sell the most are, it must be said, are the keenest artists and who work at their art through the week, mostly at home. Even if members don't wish to exhibit, they can still enjoy the experience in helping out at the exhibitions. This offers the opportunity to meet the public and, importantly, to learn what involves in putting on an exhibition. Why not visit us to find out more? Often, prospective new members, those who have long held the thought of taking up art, are reluctant to take it up because of the typical myth that you must be good at art, or drawing, before you start! That you need to be born a 'natural artist'. This isn't true. All you need is a desire to want to learn art, drawing, painting. This is why I strongly advise to come along and visit one of the classes to find our more, talk to members and see what they have learned. Visiting one of our exhibitions is also a great opportunity to see members' finished work actually framed and displayed. All you need to do is contact me a few days in advance.